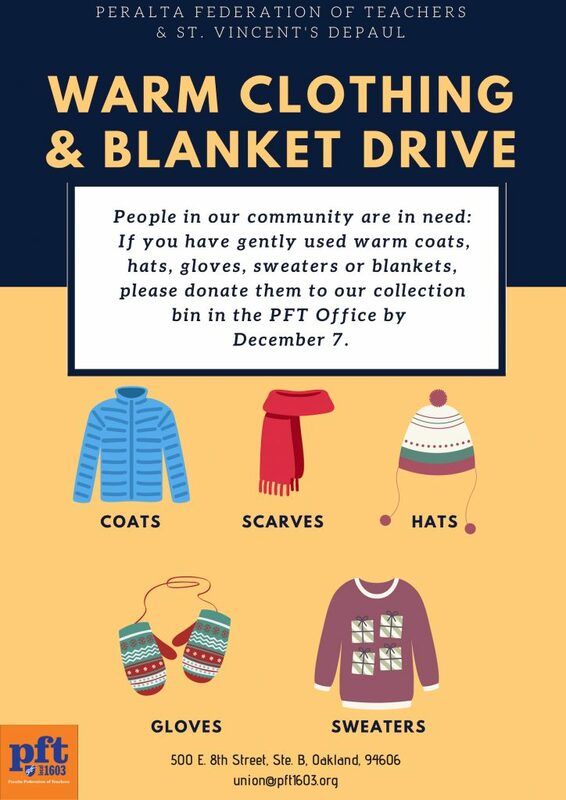 The Peralta Federation of Teachers, in partnership with St. Vincent de Paul, wants to help community members in need of warm clothing and blanket this winter season. As the temperatures cool down, many in our community will need warm blankets, coats, sweaters, pants, hats & gloves. Please donate any gently used items in your possession to the collection bin we have placed in the PFT Offices. There are also Collection Bins on each of the Peralta Campuses, as well as the District Office. We are collecting these items through the first week of classes (Deadline: December 7th). Even one coat, sweatshirt or blanket will help to keep a community member warm this winter. Please take a moment to donate items you are not using to our collection bin today!